A beautifully realised, highly characterful recreation of a popular germanium-based EQ from the heyday of British pop. Excellent sound quality. Refreshingly different. Easy to use. Easy on the eyes. Agreeable price. Low band is boost-only. AU version is 32-bit only. The latest entry in Acustica's steady stream of impulse-based EQ emulations, Blue EQ harks back to the legendary British equalisers of the 60s, although it actually takes its lead from an American model: the Chandler Limited Germanium Tone Control. 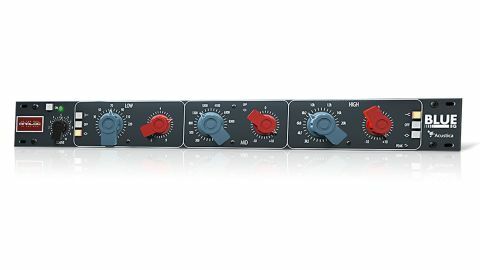 "Blue EQ goes beyond the simple cutting and boosting of specific frequencies, with an inherent liveliness and aggression"
This is a highly-regarded modern EQ built using the same technology that powered some very famous British gear of the past, including EMI's early TG series, old Neves and even some Fairchild boxes. The technology in question took the form of germanium transistors in high voltage circuits, and those EQs were used on a vast number of popular recordings during the so-called 'British invasion'. Blue EQ isn't a dead-on copy of the Chandler - in fact, visually it resembles the similar Curve Bender from the same company - but it is inspired by it, the two sharing some important features. The signal hits the GDrive drive stage (presumably where the germanium magic is applied) first, before being sent through the three-band EQ comprising Low, Mid and High bands. The Low and High bands can be switched between shelving, peak and bell behaviour, or bypassed. The Mid section is always active and always a bell shape. The Low band can be swept from 30-220Hz and can apply up to 9dB of gain - with no ability to cut, this one is all about dialling in punch. The Mid section has a sweepable frequency range from 800-8300Hz. With this one, you're given a full 10dB range of cut or boost. Finally, the High section sweeps from 3.2kHz all the way up to 20kHz, again with up to 10dB of boost or cut. Acustica's proprietary VVKT technology - in simple terms, a type of advanced convolution utilising 'multisampled' impulse responses capable of recreating harmonic distortion - along with their meticulous attention to detail have delivered an equaliser that transcends what you'd generally expect from a software EQ. Blue EQ goes beyond the simple cutting and boosting of specific frequencies, with an inherent liveliness and aggression that imbues the source signal with real edge and bite. At the low end, things can get truly earth-shaking, while highs can be taken to piercing extremes without becoming painful at any point, and the mid band is great for piling on (or removing) presence as you like. It's definitely not meant to be a clinical EQ, and you wouldn't call it up for precision work - no, this is every bit the 'character' EQ. If we have any gripes, they're that the Audio Units version is 32-bit only - a bit of a disappointment for Logic Pro X users, who will have to pony up for a 32-bit bridge such as 32 Lives to reap Blue EQ's delicious rewards. The VST version, we're pleased to say, suffers no such limitation, being available in 32- and 64-bit versions for Mac and Windows, and representing excellent value for money. Our favourite of Acustica's Acqua series thus far.